These last couple of weeks have been spent doing as much gardening as possible with every bit of free time available. The weather has been outstanding. I have to say it... "I am having so much fun." I will post later about some of the progress I am making but for today-- have a look at some of the wildlife and critters I've captured while doing spring clean-up/projects. If you read my blog regularly you might be thinking "how many times is she going to show us the hawks?" Well, if you are asking that question - the answer is -I don't know. They DO grab my attention frequently. I don't think I can stop taking photos of them. It's easy to notice them for they are large and beautiful and their piercing cries are all around me while I work. Even when I don't look up to watch them their flying shadows are cast over me. Today there were 6 and 7 of them at a time, for long periods of time, making all kinds of noise swooping and flying and mating. 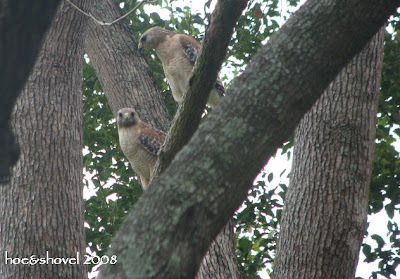 Yes, mating-- right there on this tree limb in my yard. Gardening includes science lessons galore. I get just as excited when I see ladybugs as I did when I was a child. This one on an American Beauty Berry plant. I'm thinking it was saving the plant from a big bad aphid or two. Carolina Wrens are most interesting. There are so many of them around hoe and shovel. What I love most about them is their remarkable ability to sing like what you would imagine would be a much larger bird. They have a wide range of melodies to soften the air and help me get my work done. Oh how I adore the distinct and cheery chirp-chirp of the Pileated Woodpecker. After missing my opportunity to snap a Downy Woodpecker due to bad lighting early this morning, I was very happy to notice this fellow fly in and land on my neighbor's tree stump. Happily I was able to get close enough to photograph. So many times in the past getting close enough has kept me from a good photo-op with these guys... they do like those really tall trees. Fortunately for me they are frequent and regular visitors. Same one... it flew from the stump to the tree and got right to business. Not only do they make very distinguishable melodious chirping but what beautiful features they have. It is a double blessing to garden and to benefit from the wonders of nature at the same time. 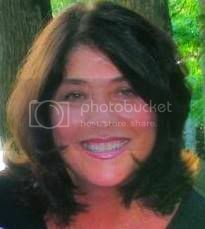 blogger's note: I tried to publish this post last night and due to technical difficulties couldn't use my internet... I haven't gone back in to edit my references to "today " so this is actually yesterday's account. Now I am back outside for more early morning gardening- I have 3 yards of dirt being delivered this morning... woo-hoo! Don't you dare stop showing your Hawks. They are beautiful. 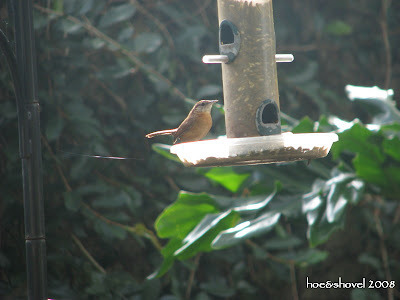 Your gardens must ideed be a peaceful place since you are blessed with such lovely avian visitors. I too love to have Carolina Wrens in the garden. They are always so busy and seem so joyful with their song. If I had a Pileated Woodpecker in my garden I would turn a flip in excitement. They are so striking. And you get a load of dirt delivered. I am so Greeen with envy. I would love to be out doing something in the garden. Not my time yet. I must be patient. Popped in for some sunshine ... I envy your time in the garden. Mine, sigh, is still beneath a blanket of white snow. 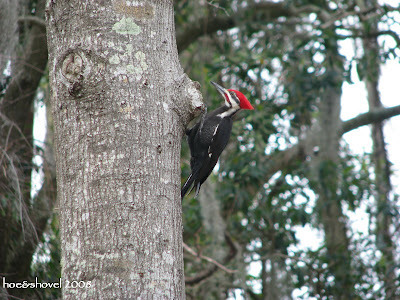 What a handsome Pileated Woodpecker ... I photographed perhaps his relative at the lake last weekend where we were 'iced' in and had to be towed up our huge hill by a 10 ton fork lift with chained 'spinning' tires (not fun). Like Lisa, I will never tire of the hawks, red head or any of the bird photos or of the birds themselves in my own garden. They are the icing on the gardening cake. Thanks. I would show the hawks all the time too. Don't they frighten away your little birds? I adore the chickadees. They make such a fuss when I go outside with the dogs or the cat! Oh, I love the bird pictures! I never tire of seeing them. I caught a hawk eating today. I'll be posting it later. They are definitely spectacular creatures. 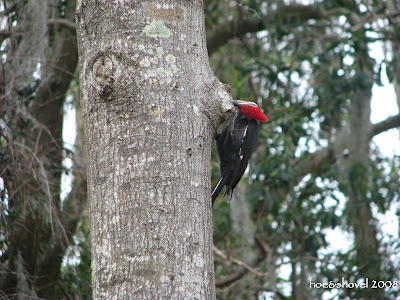 I'm looking forward to the return of the Pileated Woodpeckers. You're right, getting a photo of them can be tough. They don't like me sneaking up on them. I curse the Basswood trees on our property until I remember a variety of woodpeckers seem to love them. Your hawk photographs are wonderful - I don't think I'd ever tire of them. So, by the way, are the woodpecker and Carolina wrens. I miss bird activity during the winter here. I am imagining you've had a wonderful time with all the new dirt delivered! Lisa: try not to be green... soon I will be the one escaping indoors for the a/c in trade for the heat... and you will be loving your beautiful days outside... all day. Here's to warmer weather for you. frances: oh you nailed it... all the birds are welcome and to me they make gardening even more wonderful. Robin (bumblebee): the hawks have actually eaten the little ones at times but there is so much tree coverage the little ones seem empowered by their ability to make quick get aways. Robin: Spectacular indeed whether flying, perching, soaring, diving it is all fascinating and entertaining. Wiseacre: Isn't it intriguing how woodpeckers know just where to go? 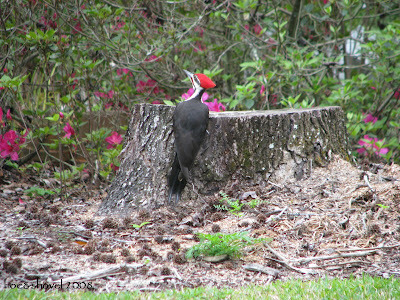 How did that Pileated know that stump was a stump? Kate: The dirt is for my brand new raised beds I am so excited to finally have. Still some dirt left over I will have to move around to the back tomorrow. Very fun stuff! Wow... the pictures are all wonderful! I love the hawks--if I had them in my backyard (and a good enough camera to catch them on film) I would post pictures of them all the time, too. Does your camera have durt smudges all over it. Mine does. WE got to hurry and get the shot. I can look at garden pics over and over so keep posting the same subjects cause they are never doing the same thing--well, unless they are mating. It's a LOVEly time in the garden during Spring. Blackswamp Girl:Welcome to hoe and shovel- thanks for stopping in.My camera is not great for capturing birds so it is a challenge to get close enough. I love it anyway and just keep snapping. Meems, your blog is such a beautiful place to visit. Most blogs I visit are copycat productions of another...lots of words accompanied by "borrowed" stock photos. 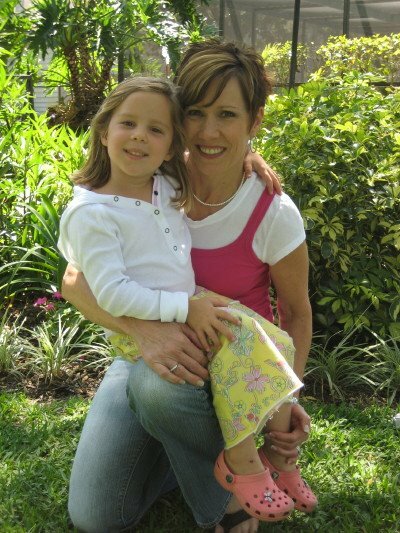 It's so nice to visit a blog where the pictures are one of a kind...and lovely to look at. I need to visit some other garden blogs I suppose...but for now yours is the only one and a much-needed dose of color to my black and white (print) life. mlm: you are always my big fan and thanks to you for all your kind words. 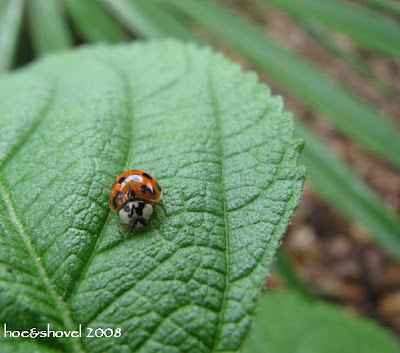 There are many wonderful garden blogs out there with beautiful photography. It just so happens that you spend time on those "smarty pants" blogs that intellectuals visit... so I'm glad you stop by once in a while for a colorful "fix".